Chris Wilder is looking forward to Saturday’s ‘game of the day’ when high-flying and in-form Bristol Rovers visit his champions-elect Cobblers side. With Rovers third and Northampton top, Saturday’s clash promises to be one not to miss, especially in front of what could be a record Sixfields crowd. Rovers have sold their allocation for the trip east while Northampton fans continue to buy tickets for the recently reopened East Stand. 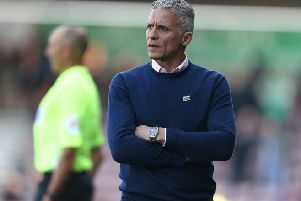 Cobblers could seal promotion with a win too, while three points for Darrell Clarke’s side would take them a giant step closer to back-to-back promotions. Looking ahead to the game, Wilder said: “We understand that every opposition that comes here – whether they’ve got nothing to play for, whether they’ve got a new manager, whatever their situation – they don’t want to be the team we party in front of. “The situation’s a bit different on Saturday because they have got something to play for. “It’s going to be the game of the day in our division and I’m sure it will live up to its billing. “It’s been a bit of a strange situation because we’ve realised during the past couple of weeks that it’s going to happen and we’re just wondering when that will be. “Teams are running out of games but it hasn’t happened just yet. “It still doesn’t take anything away from the efforts this group of players have put in. Rovers are the only team in League Two to have taken more points in the last 10 games than Northampton, who have slightly eased off the gas with five draws in the last eight following their record-breaking 10-game winning run. Wilder added: “I don’t think we’ve been at our free-flowing best over the past month, but we’ve shown other qualities that are needed to win games of football. “The race has been on since Christmas and going into March and April we’ve shown a great quality to pick results up. “We always want to get the ball down and play but the situation we’re in is one that we’ve had to handle, and we’ve handled it pretty well.